For Ivy Ken, sociology is the study of why things don’t have to be this way. The discipline contributes to our understanding that Black lives can (and must) matter; that women can be paid fair wages; and even that food on children’s school lunch trays can be fresh and tasty. Like most sociologists, Professor Ken centers her scholarship on the social structures that contribute to problems like these. In addition, steeped in intersectional theory, she studies what constitutes these social structures as they are. In her most recent work, Professor Ken studies the poor state of school feeding programs in the United States and Chile. She has documented how, in both countries, local and national governments collude with large, for-profit food service companies that serve children the cheapest products possible. These companies—many of which have been found guilty of fraud—often pay meager wages to their own employees and exert pressure on their suppliers and producers as lead firms in complicated commodity chains. In Chile, this reliance on the private delivery of a public service results in children eating over four times the recommended amount of sugar each day while at school. In the US, it has children regularly eating packaged, processed products that bear little resemblance to food. But it doesn’t have to be this way, so in her analyses Professor Ken incorporates cases where students are connected with the sources of their food, and uses the generative tools of social theory to identify ways that corporate influence over this public responsibility can be minimized. Professor Ken’s work in this arena has been sponsored by a Fulbright Scholar award and a GW Global Women’s Institute Research Fellowship. Professor Ken’s scholarship on food reflects the robust emphasis at GW on issues of sustainability, including the work of its Food Institute. She, along with a multi-disciplinary group of faculty from that Task Force recently convened a year-long University Seminar on Food, which highlighted issues of food policy such as the DC Healthy Schools Act and the Farm Bill. This work complements a course Professor Ken teaches on the sociology of food, which has been supported by the GW Honey W. Nashman Center for Civic Engagement and Public Service. Along with this course, Professor Ken regularly teaches classical and contemporary theory, with an eye to disrupting the typical narrative about theory that gets told in the discipline, and a graduate seminar on race, gender, and class. Professor Ken has also taught the department's newest course, The Sociological Imagination, which engages students with the discipline of sociology through local civic engagement projects. Professor Ken is a recipient of The George Washington University's Bender Teaching Award and the Robert W. Kenny Prize for Excellence in Teaching. 2017. Kenneth S. Leon and Ivy Ken. “Food Fraud and the Partnership for a 'Healthier' America: A Case Study in State-Corporate Crime.” Critical Criminology DOI 10.1007/s10612-017-9363-x. 2016. Ivy Ken and Benjamín Elizalde. "“ ‘We Began to See that We Were Valuable’: Rural Chilean Women’s Transformation from Depressed Wives to Organic Farmers.” Yearbook of Women’s History 36, Special Issue: Gendered Food Practices from Seed to Waste. 2014. Ivy Ken. "Big Business in the School Cafeteria." Contexts 13:84-87. 2014. Ivy Ken. "A Healthy Bottom Line: Obese Children, a Pacified Public, and Corporate Legitimacy." Social Currents 1:2:130-148. 2014. Ivy Ken. "Profit in the Food Desert: Walmart Stakes its Claim." Theory in Action 7:4:13-32 (Special Issue: Food Justice and Sustainability). 2010. Ivy Ken. 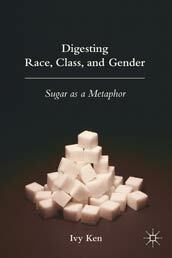 Digesting Race, Class, and Gender: Sugar as a Metaphor. New York: Palgrave Macmillan. 2008. Ivy Ken. "Beyond the Intersection: A New Culinary Metaphor for Race-Class-Gender Studies." Sociological Theory 26:2:152-172. 2007. Ivy Ken. "Race-Class-Gender Theory: An Image(ry) Problem." Gender Issues 24:2:1-20. 2007. Sandra Hanson, Ivy Kennelly, and Stephan Fuchs. "Perceptions of Fairness: Gender and Attitudes about Opportunity and Status among Women Scientists in Germany and the U.S." Journal of Women and Minorities in Science and Engineering 13:3:231-258. 2006. Ivy Kennelly and Roberta Spalter-Roth. "Parents on the Job Market: Resources and Strategies That Help Academic Parents Attain Tenure-Track Jobs." The American Sociologist 37:4:29-49. 2006. Ivy Kennelly. "Secretarial Work, Nurturing, and the Ethnic of Service." NWSA Journal 18:2:170-192. 2004. Roberta Spalter-Roth, Ivy Kennelly, and William Erskine. "The Best Time to Have a Baby: Institutional Resources and Family Strategies among Early Career Sociologists." American Sociological Association Research Brief. 2002. Ivy Kennelly. " 'I Would Never Be a Secretary': Reinforcing Gender in Segregated and Integrated Occupations." Gender & Society 16:5:603-324. 2001. Ivy Kennelly, Sabine Merz, and Judith Lorber. "Comment: What is Gender?" American Sociological Review 65:4:598-605. 2001. Marina Karides, Joya Misra, Ivy Kennelly, and Stephanie Moller. "Representing the Discipline: Social Problems compared with ASR and AJS." Social Problems 48:1:111-128. 2000. Linda Grant, Ivy Kennelly, and Kathryn Ward. "Revisiting the Gender, Marriage, and Parenthood Puzzle in Scientific Careers." Women's Studies Quarterly 28:1&2:62-85. 1999. Irene Browne and Ivy Kennelly. "Stereotypes and Realities: Black Women in the Labor Market." Pp. 302-326 in Latinas and African American Women at Work: Race, Gender, and Economic Inequality. Edited by Irene Browne. New York: Russell Sage Press. "From Voiceless to Valuable." GW Food Institute commentary. "Good Food Purchasing Programs." GW Food Institute commentary. Posted 24 January 2017. "Cultivating Better Urban Food Systems," at the 2015 Food Tank Summit, Washington DC. “Cheap Food and Women’s Work.” With Benjamín Elizalde. Gender & Society blog (https://gendersociety.wordpress.com/2016/03/10/cheap-food-womens-work/). Posted 10 March 2016. “White Fear of Black Success.” Women In and Beyond the Global blog (http://www.womeninandbeyond.org/?p=18878). Posted 19 June 2016. “In Chile, Lunch Ladies Beaten and Detained.” Women In and Beyond the Global blog (http://www.womeninandbeyond.org/?p=19425). Posted 16 October 2015. “Keep Food Companies Out of WHO Policy Making!” Women In and Beyond the Global blog (http://www.womeninandbeyond.org/?p=18795). Posted 4 June 2015. “No Black Children Allowed.” Women In and Beyond the Global blog (http://www.womeninandbeyond.org/?p=18643). Posted 7 May 2015. How are the ways that race organizes our lives related to the ways gender and class organize our lives? How might these organizing mechanisms conflict or work together? In Digesting Race, Class, and Gender: Sugar as a Metaphor, GW Sociology Professor Ivy Ken likens race, class, and gender to foods – foods that are produced in fields, mixed together in bowls, and digested in our social and institutional bodies. In the field, one food may contaminate another through cross-pollination. In the mixing bowl, each food’s original molecular structure changes in the presence of others. And within a meal, the presence of one food may impede or facilitate the digestion of another. At each of these sites, the “foods” of race, class, and gender are involved in dynamic relationships with each other that have implications for the shape – or the taste – of our social order.